Over the centuries Lithuanian cuisine was influenced by several nationalities, starring various potato dishes and mushrooms, all washed down with good beer. Lithuanian cuisine features products suited to the cool and moist northern climate of Lithuania: barley, potatoes, rye, beets, greens, berries, and mushrooms are locally grown, and dairy products are one of its specialities. Since it shares its climate and agricultural practices with Northern Europe, Lithuanian cuisine has much in common with its Baltic neighbours and, in general, northern countries. It also shares some traditions with Polish and Ukrainian that date back to the grand duchy times. German traditions have had a big influence on Lithuanian cuisine, introducing pork and potato dishes, such as potato pudding (kugelis or kugel) and intestines stuffed with mashed potato (vėdarai), as well as the baroque tree cake known as Šakotis. Over the centuries Lithuanians have created a unique palette of dishes, influenced by the culture of various nationalities. 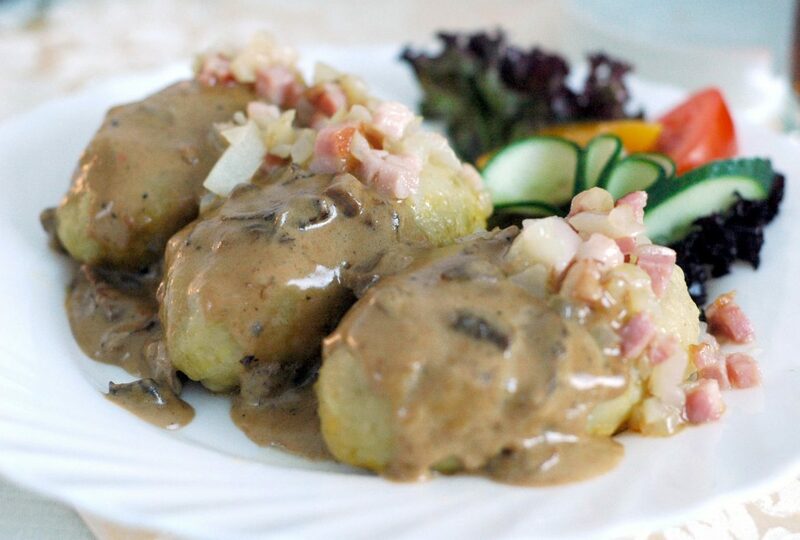 A distinctive trait of Lithuanian cuisine is the predominance of potato dishes. The most impressive of these is cepelinai (‘Zeppelins’), large boiled potato dumplings (made from grated raw potato) with fillings of minced meat or cottage cheese. Other traditional potato dishes are various types of kugelis (potato loaf) and potato salad, potato pancakes made from grated raw potato or boiled potato (sometimes with a meat filling), and small potato dumplings with mushroom or berry filling. Perhaps the most exotic Lithuanian dish is vėdarai or ‘potato sausages’, pork intestines stuffed with grated raw potato, baked in a wood stove or electric oven. An important place in Lithuanian cuisine is occupied by small dumplings (called koldūnai or virtiniai) made from dough and with a filling of meat, mushrooms, berries or cottage cheese. An interesting variety of koldūnai is “tinginiai” (“lazy bones”) – half-moon shaped dumplings with a filling of freshly crushed blueberries. In most Lithuanian restaurants you can order kibinai and čeburėkai, which are imports from Karaim cuisine. Also popular are various types of pancakes made from flour (instead of grated raw potato), some with fillings of fruit or berries, others ‘plain’, made from yeast-raised dough, and served dipped in sour cream or berry jam. For a snack you can try marinated or salted herring with boiled potatoes, various kinds of cottage cheese or fermented cheeses, and hot-smoked or cold-smoked hams and sausages. Lithuanians also know many recipes for mushroom dishes. Mushrooms are used in sauces, as fillings, or served as an accompaniment to meat dishes. Mushroom hunt is considered by some to be the true national sport of the country, with the boletus variety being the ‘king of mushrooms’. Soup is very popular in Lithuania. There is vegetable soup, meat soup, soup with chicken or other poultry or game, even beer soup. One of the most interesting Lithuanian soups is šaltibarščiai (cold beetroot soup), which is made from beets/beetroot, kefir (a fermented milk product), greens and boiled eggs. This dish is most popular when served on a hot summer day. Traditional Lithuanian beverages are gira (non-alcoholic drink made from rye bread), kisielius (fruity cranberry drink), beer, various spirit drinks with fruit or herbal infusions and, of course, mead. In olden times Lithuanians made a large variety of gira drinks. Gira was made not only from bread, as is the most common now, but also from various berries, fruits, blossoms, buds, saps, juices, decoctions, grains, malts, cakes and even honey cake. Gira connoisseurs will tell you that ‘bread gira’ is not a very good generalisation, because different kinds of gira were made from rye, wheat, barley or oat bread. Another non-alcoholic Lithuanian drink is kisielius, usually made from cranberries (but sometimes also raspberries or gooseberries), starch and sugar. Lithuania is known as a beer-loving country. At present there are 84 breweries, large and small, operating in Lithuania, producing beer that may be light or dark, weak or strong (by law the strongest beer allowed is 9.5% alcohol by volume). Each brewery produces several varieties. The region of Biržai has long been known for its dark, strong beer, while light barley beer is produced in every region. A few years ago some breweries began producing wheat beer.